Here you have my list of 16 best canvas tents for camping that are on the market in 2019, all very unique models and suitable for 4 seasons and for all climates. Best canvas camping tents for 4 seasons. Those are durable tools. Some manufacturers write that if you buy such a tent, you will leave it to your grandchildren, and they might not exaggerate. Some of them are built from a cotton and polyester mixed fabric so they incorporate the best from both worlds, you will see some examples below. Such canvas tents are breathable and this makes lots of difference. One of the biggest issues with synthetic tents is ventilation and condensation. 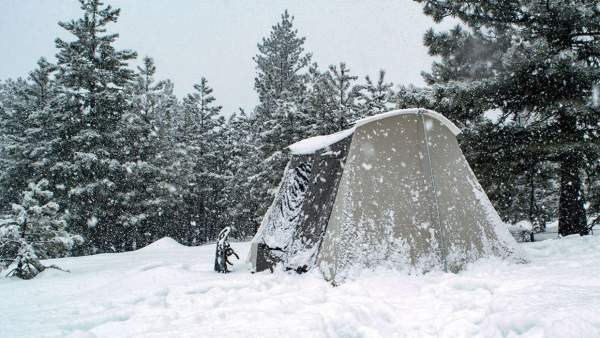 Several people in a tent may exhale a couple of liters of moisture during the night, and this vapor tends to condensate on the cold walls and on your stuff. This is why vents in such tents are essential. In a breathable canvas tent, this problem is reduced to a minimum, and many of them also come with vents, you will see such examples below. Practically all of them are designed for all seasons. From many points of view, they perform better both in a warm climate and in a cold climate. Such a canvas tent gives a bit of insulation, and in summer it makes the atmosphere in a tent cooler than a synthetic tent. Some of these tents come with one or even two stove pipe jacks. 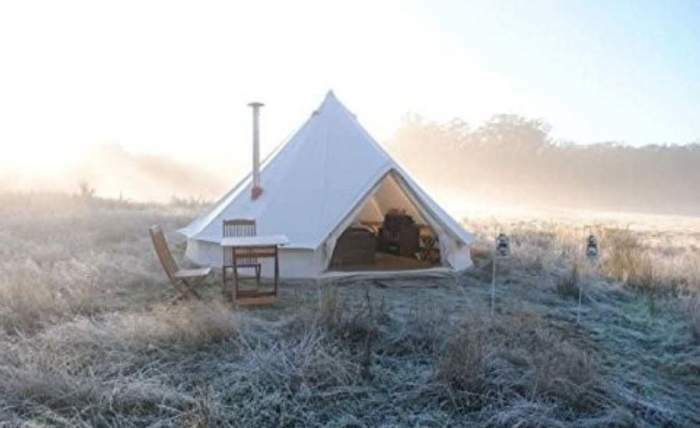 Such a tent combined with a wood stove is suitable for the coldest environments. As I said above, canvas tents are heavy but there is a good side to it – they are quieter than thin synthetic materials that tend to flap even in the lightest winds. Some of the canvas tents are built to provide a sound insulation as well, you will see a great example below, an insulated canvas tent. Canvas tents are more durable regarding the UV radiation. But I mentioned that canvas tents are complicated for maintenance, you will have mold developed if you store it wet. So keep the tent clean and bone dry before you store it at home. They are also flammable so some manufacturers use chemicals against it. Note also that some of these tents have a coating for water resistance but this reduces breathability. Poly-canvas tents, so this is a mix of canvas and polyester. All of them are with a synthetic floor, and all are heavy, therefore the frame is always steel. Seasons-wise, all of them are 4-season tents. Space-wise, those are large and tall tents. I give only a few basic details here, but all are described in my separate reviews so please follow the links for more details and for updated prices. Alpha Kilo 4000 Canvas 6 Person Bow Tent. This is a rather unique canvas tent here in the list because of its dome structure. The tent is with a minimal fly which protects the vents on the roof and it extends into an awning which you see in the picture. You have a single rooms structure which is very tall 84 inches (213 cm), and with one door and two windows. All openings are with mesh and panels. This is a design for 4-season use, incredibly durable and reliable. The dome poles are spring steel. Note that the tent is very heavy 90 lb (40.8 kg) and bulky when packed. The dimensions are 10 x 10 ft (305 x 305 cm) so you have an area of 100 ft² (9.3 m²). The declared capacity is 6 people. Crua Loj 6 Person Thermo Insulated Waterproof Family Tent. There is no tent currently on the market that could be compared with this Crua Loj 6. This is the only insulated tent of this type and this is a huge 3-room structure plus a fully enclosed porch with a vestibule. Its R-value is 4 so imagine what you have here. The tent is with 3 external doors and 2 inner doors, the frame is steel and the material is breathable, so you have the inner tent fabric which is 65/35 ratio poly-cotton, and the outer shell is a laminated poly-cotton 80/20. It comes with a footprint included and with an insulated carpet. The materials are such that this is a dark rest design and you also have sound insulation. Note that you have 6 PVC windows. The total inner protected area is 235 ft² (22 m²) and the porch area is 65 ft² (6 m²). The only difference between the two is that the porch is without the floor. Please follow the link for more. DANCHEL Cotton Bell Tent with Two Stove Jacket. Here you have a bell-shaped tall canvas tent with a 5-meter diameter. So you have an area of 216 ft² (20 m²) and this is enough for the declared capacity of 8 people. It comes with 2 stove jackets, so you can use a wood stove inside. This is why I have included it in my list of cold weather tents for camping. But this tent is indeed for all seasons. The structure is supported by the central pole and the setup is easy, one person can do it without problems. Note that the floor is a thick synthetic material so you are safe from groundwater. There is a zipper that goes all the way around and you can unzip the floor and use the tent as a canopy for family events in the garden. The structure is with 4 small windows on the vertical wall under the skirt, so you have mesh here and panels. There are 4 vents high on the roof so ventilation should be good in any conditions. Jet Tent F25DX 10 Person Camping Tent. 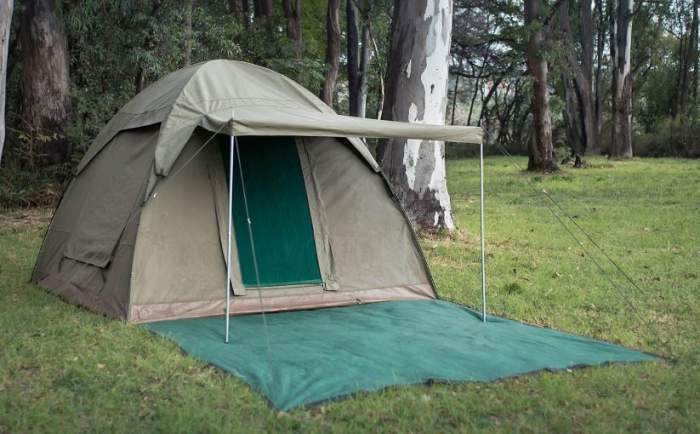 This F25DX is a poly-cotton or poly-canvas tent, which means they have added a bit of polyester to improve its performance. But it keeps all the best features from a canvas tent and the breathability is the most important one. This is a very unique design and the list of its features is long. So you have 3 rooms here, and the structure is a sort of an extended cabin with the central section which is an instant setup design. There are two extra poles that you add to the sides, and those give support to the two side rooms. The structure is with 7 windows and you also have huge ventilation openings on the roof. Note that it comes with a minimal coverage fly which is synthetic, so you have a full protection on the roof where you need it most. The floor is also synthetic but this is common for all tents here. The official capacity is 10 people and the total inner area is 186 ft² (17.25 m²). Kodiak Canvas 12×9 Canvas Cabin Tent. This is a unique cabin style tent and a particularly tall structure with 90 inches (229 cm) peak height. The tent is full of great features and this is a pure canvas tent except for the floor which is synthetic. You have a top quality craftsmanship and the tent is totally reliable and you can use it throughout the year and in all weather conditions. The tent is not freestanding, but this is typical for most of the canvas tents. You have a steel frame plus two poles which you use for an awning configuration shown in the picture above. It comes with an E-cable port, and you have 2 doors (with windows), plus 4 separate windows. The area is 108 ft² (10 m²) and the declared capacity is 6 people. Note that this is a very heavy structure, 92 lb (41.7 kg). Please follow the link for more. Kodiak Canvas Flex Bow Basic 6 Person Tent. 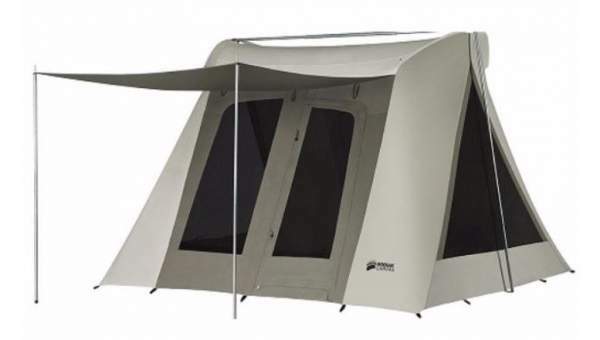 The word Basic in the name of this tent is used only to distinguish it from some other models of the same brand that offer more features. But in reality, this is a really luxurious camping tent with a walk around height and suitable for all seasons and for all climates. So this is a canvas tent and they make it breathable, and this is why it performs well regardless of where you are going to use it. You have two doors and two separate mesh windows that are also equipped with panels. The tent comes with a huge 6 x 6 ft awning on one side. It is heavy 68 lb (30.8 kg) and bulky when packed, so bear this in mind when you plan to transport it to your camping area. It is not freestanding so choose a place where you can stake it down properly, you have 18 long steel stakes included in the package. The official capacity is 6 people and the floor area is 100 ft² (9.3 m²). This is a tent with a high level of craftsmanship, built to last for many years. The price may look a bit high but this is typical for canvas tents, please follow the link to check for the updates. Kodiak Canvas Flex Bow VX Waterproof Quick Tent 6011 With Tarp. This is a canvas tent with a fabric which is kept breathable, a tall and pleasant structure with a walk-around comfort. The tent has 2 doors and 4 + 2 windows. All these openings are double layer structures with mesh and canvas panels. The area is 100 ft² (9.3 m²) and the declared capacity is 6 people. It is quite heavy, it weighs 68 lb (30.8 kg), and it is bulky when packed. The structure is suitable for all-year-round use, and it is also suitable for all climates. The frame is steel and as the name suggests, you have spring steel rods that create tension in the roof. Note also that this tent comes with a tarp included. OzTent 30 Second Expedition Tent RV 5. Here you have an example of an instant setup canvas tent. As its name suggests, one person can indeed raise it in under 30 seconds. But I must add, there is a price for that, it costs a lot and its packed size is huge. Namely, the packed size is 78.7 x 15.7 x 7.1 inches (200 x 40 x 18 cm) so not every car can be used to transport this tent. 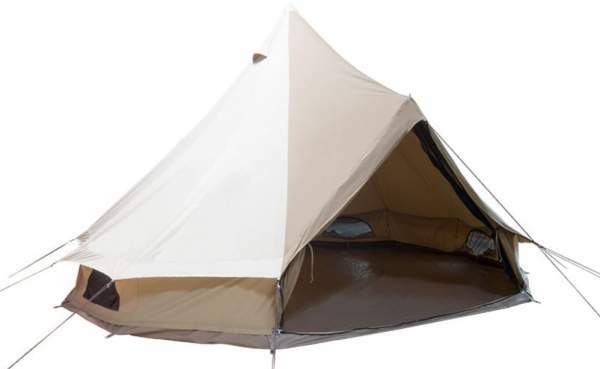 The reason for such a length in the packed size is its frame which is preattached to the tent. But this is an exceptional award-winning design, a fully waterproof tent suitable for all seasons and for all climates. You have openings on all sides, and all of them are with mesh and closable panels. This is also a tent with a stand-up height. Please follow the link to read more. The Highline 8 tent offers 140 ft² (13 m²) of the area in its single-room structure with a single but large door and several large windows. The structure is with the 78 inches (198 cm) peak height. Obviously, this is a canvas tent, and only the floor is a heavy-duty fully waterproof 14 oz laminated vinyl. The tent is heavy and bulky when packed but this is a very strong and clever steel construction so only two legs-poles support the structure. In spite of its size and weight, one person can set it up easily. 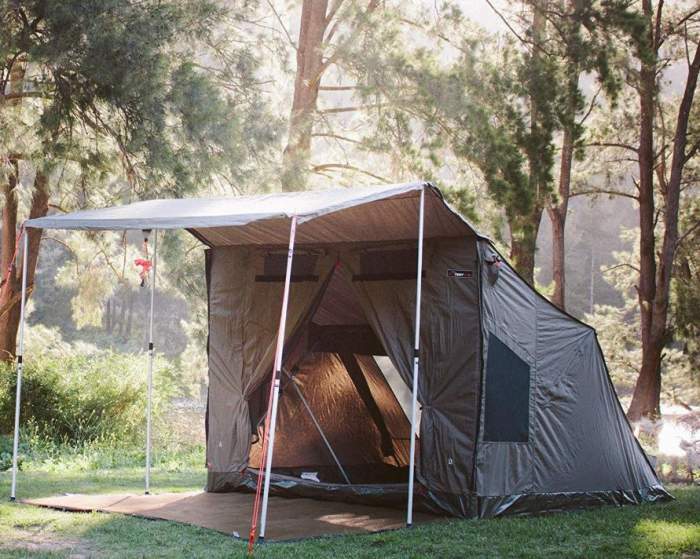 This is a tent for all seasons, designed to perform well in any climate. It makes the atmosphere cooler in a warmer climate, and it gives a bit of insulation when used in a cold environment. Please read more in my full review. Teton Sports Mesa 14 Canvas Tent. 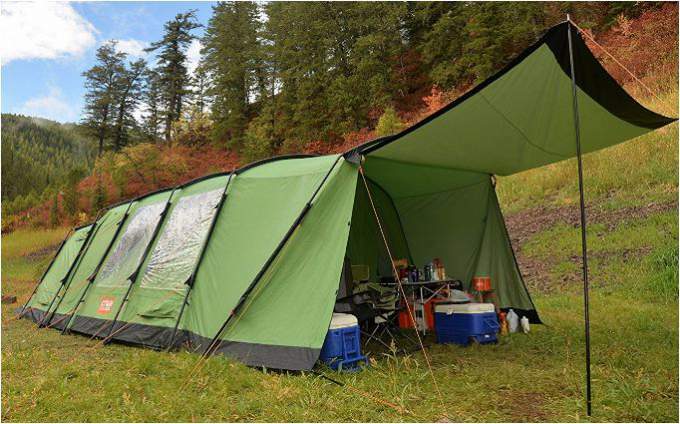 The Mesa 14 is a part of the series which includes several tents built in the same style, but with the difference in the area only. By style, it is very similar to the Springbar 8 tent, but when you look closer you realize that there are some important differences, like the 2 doors which you have here on the two sides and also the roof poles structure is different. The dimensions are 14 x 10 ft (427 x 305 cm) so the total area is 140 ft² (13 m²). As you see from the picture above, it comes with an integrated awning. The fabric is 100% canvas and the frame is steel. This is a tent for all seasons and for all climates. It is important to stress that it is more affordable than the Springbar Highline 8 tent, so please follow the link to check the updated price. Teton Sports Sierra 16 Canvas Tent. The Sierra 16 is one of the three tents from their series, so the number 16 describes the diameter in feet; the other two tents are 12 and 20 feet in the diameter. So the area is around 200 ft² (18.6 m²) and the capacity is 8 – 12 people. As you realize, this is a bell-shaped tent so the structure is enormously high, no less than 9 ft 5 in (287 cm). This is a canvas tent and only the floor is synthetic. You have a huge door and the structure is single-room by the design, with 4 small windows around. There is only one central pole which supports the whole tent, plus a door pole on the front. The floor is with a zipper so you can unzip it completely and use the tent as a pleasant canopy for family events in the garden. This is a 4 season tent. Please read more in my full review. Trek Tents 246C Cotton Canvas Cabin Tent – 10 x 14 Feet. 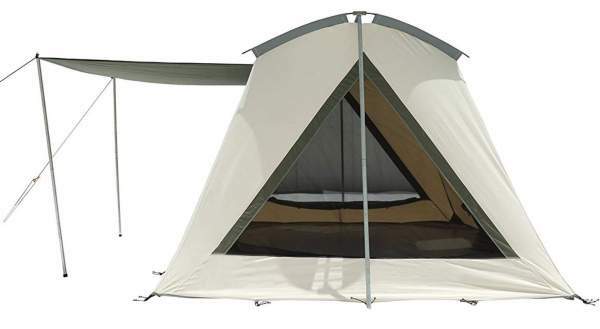 This is a very tall tent, with 229 cm (90 in) peak height. As its name says, this is a canvas tent and this is why it is here in the list. The official capacity is 9 people, and the floor area is 140 ft² (13 m²). This is a single room design with a steel frame. You have 3 large windows and they are with mesh and canvas panels so you can close them when you want to preserve the warmth. The tent is suitable for all seasons and for any climate. Note that this is a rather heavy structure with 64 lb (29 kg), and the packed size of 42 x 14 x 14 inches (107 x 36 x 36 cm) is such that you need lots of space in the car. 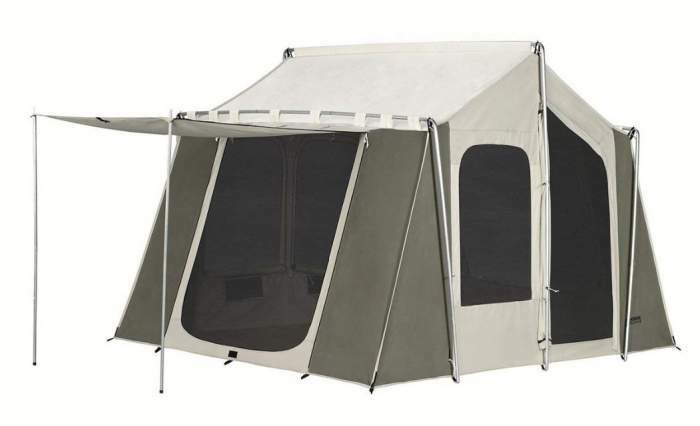 White Duck Outdoors Alpha Wall Tent 12 x 14. There are many reasons why this tent should be in this list. First of all, it is indeed a canvas tent and only the floor is synthetic. But this is a very specific design, the frame-type tent. 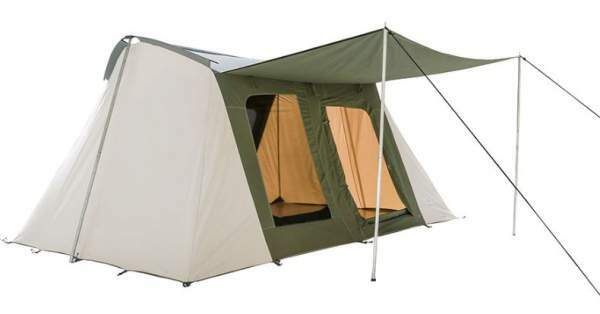 This means that the frame is set up completely separately and then you add the tent itself. The frame is a very strong aluminum construction. The tent is a single-room and single-layer structure, and its floor is removable. Note that the tent comes with a ready Stove Jack so you can just add a stove inside and have the heating. So this is a true 4-season tool and it will perform equally good in warm and in cold weather situations. The walls are fully breathable and this is why it has a rather small waterproof rating of 450 mm. Note also that the tent is heavy and bulky when packed. So the weight is 172 lb (78 kg) and it comes in two separate bags, one is 45 x 14 x 14 inches (114 x 36 x 36 cm) and the other is 49 x 14 x 10 inches (124 x 36 x 25 cm). Please read more in my full review. 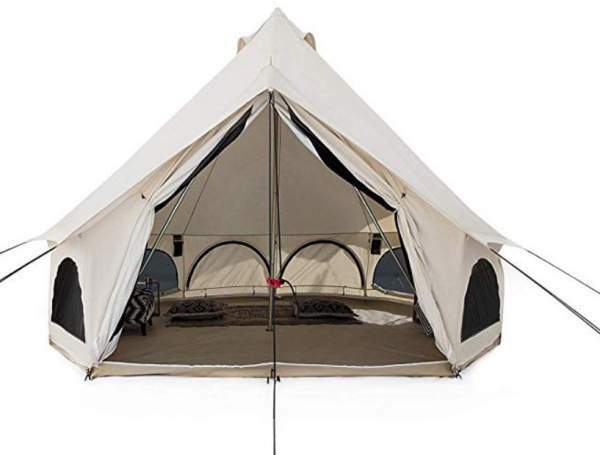 White Duck Outdoors Avalon Canvas Bell Tent. 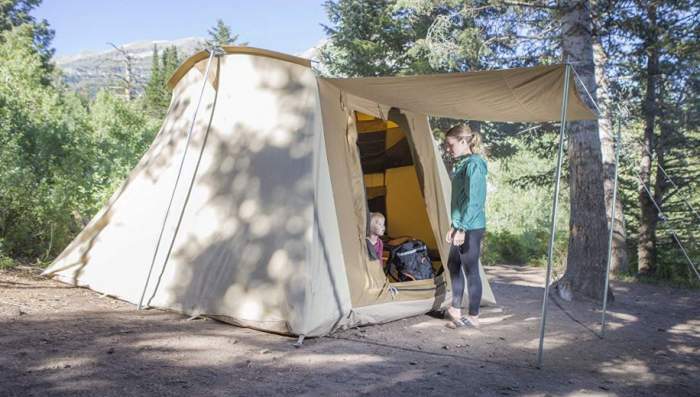 This is a very luxurious tent for family camping and glamping in all seasons. It is equipped with a flapjack for a stovepipe so it is ready for a wood stove and you can use it in a very cold environment. On the other hand, they have built it completely breathable so it is perfect also for a warm environment, note that it has 4 vents as well. The is a cotton canvas of course and it is waterproof, only the floor is a vinyl material and it is removable, there is a zipper running around. Also, all the windows are 3-layer structures so you have mesh, PVC panels, and canvas panels. The structure is quite heavy and bulky, it weighs 95 lb (43.1 kg) and the packed size is 45 x 15 x 13 inches (114 x 38 x 33 cm). The floor area is around 201 ft² (18.7 m²) and the declared capacity is 8 people, so this is more than enough space for such a number of users. I have included it in my list of extra large family camping tents. White Duck Outdoors Family Explorer Basic 10 x 14 Canvas Camping Tent. 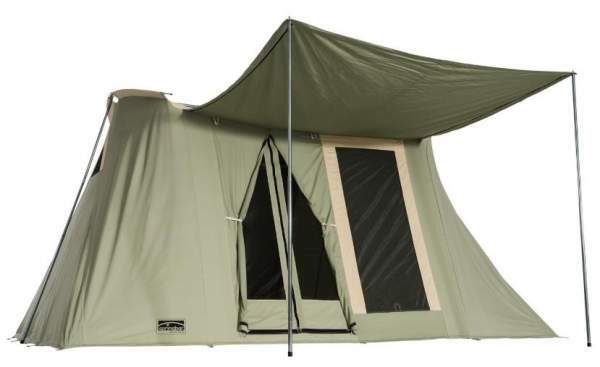 This is an 8-person tent, a single room design similar to several of the models in the list. But this is a new item on the market so this trend with canvas tents is growing. All is canvas here except for the floor, and they did not do any waterproof coating so the structure is fully breathable. You have two doors and both are with large mesh windows, plus two separate windows. It is 78 inches (198 cm) tall so the structure is very pleasant. The area is 140 ft² (13 m²) and the tent is heavy, it weighs 86 lb (39 kg). The canvas is silver-coated for heat reflection so it stays cool even in a warm environment. But this is a true 4-season tent. Please follow the link for more. White Duck Outdoors Family Explorer Deluxe 10 x 10 Camping Tent. 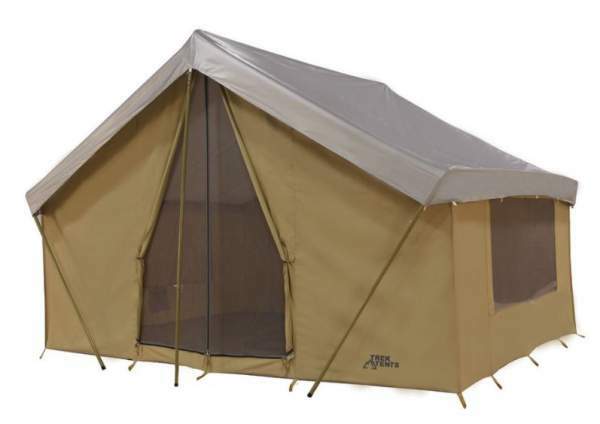 This White Duck Explorer Deluxe is an improved version of their Explorer Basic tent shown above. So in this tent, you have additional triangular windows on the side, you can see them in the picture. The total number of windows is 4 plus 2 windows on the doors, so you have views on all sides and a perfect air circulation. Here again you have a flex-bow steel roof construction and a canvas tent which is fully breathable while still being waterproof. The dimensions of the tent are in the title and the official capacity is 6 people. The total area is 100 ft² (9.3 m²) and the tent is quite heavy, it weighs 89 lb (40.4 kg) and it is also rather bulky in the packed state, 49 x 14 x 10 inches (124 x 36 x 25 cm). But in spite of that, one person can set it up easily. Please follow the link to find out more. So this was my list of the best canvas tents for camping that you can currently find on the market, all top-notch products from renown and reliable brands. The list will be updated regularly as I find new good tents on the market, so bookmark this page and come back from time to time. Thank you for reading, please let me know if you think I have missed a good tent, or if you have any question or comment. There is a comment box below.